A FROTHY, CREAMY, CAFFEINE-FREE POTION. Are you a caffeine queen? I’m always trying to cut back on my beloved caffeine. Ugh. While I allow myself one cup of coffee in the morning (because it makes me happy/keeps me sane) I’m well aware that it’s an addiction. Hey, I’m not perfect. There are better things I can be putting in my body… but it’s SO GOOD. This is the constant caffeine struggle. I have quit coffee a couple times in the past… and obviously didn’t last long ha. 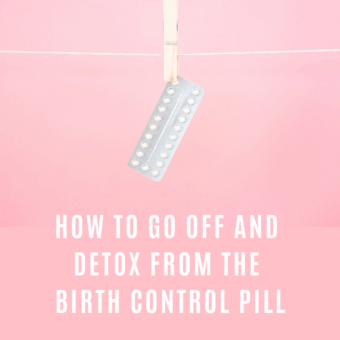 I’ve talked about it before here on the blog but to me, the whole process is all about morning ritual. Brewing a cup of coffee is what I do in the morning (after I drink my water!) and is something I look forward to as soon as I wake up. 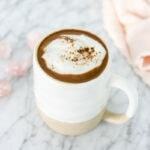 So, when I’ve already had my morning cup of coffee and I’m craving another, I make this caffeine-free Coconut Adaptogenic Mushroom Latté instead. She’s the prettiest! And tastes like a dream too. Basically whenever I want something warm, comforting and most importantly, caffeine free, this cup of heaven is my go-to, for a little pick-me-up power. 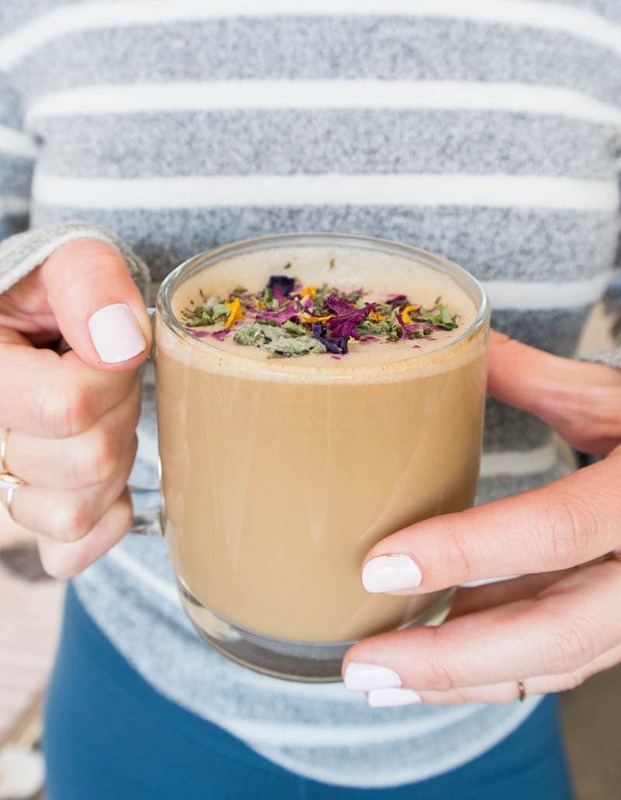 Think of this adaptogenic latté as your healing elixir; complete with adaptogens, medicinal shrooms and herbs, fused with creamy coconut milk. But does it taste mushroom-y? No, not at all, because that would be gross. It tastes like a toasted caramel latté. And no brewing required. Adaptogens come in many forms, from pills and extracts to powders and blends. They are primarily plants (or in this case, mushrooms) which tend to grow in the most inhospitable areas of the earth: deserts, cold mountains, dry and barren land, some even dating back to the ice age. Living in such harsh conditions, the adaptogenic plants have developed surreal resiliency to survive the environmental stressors surrounding them. Luckily, when we consume these adaptogens, our own ability to deal with stress in our internal and external environments greatly improves. 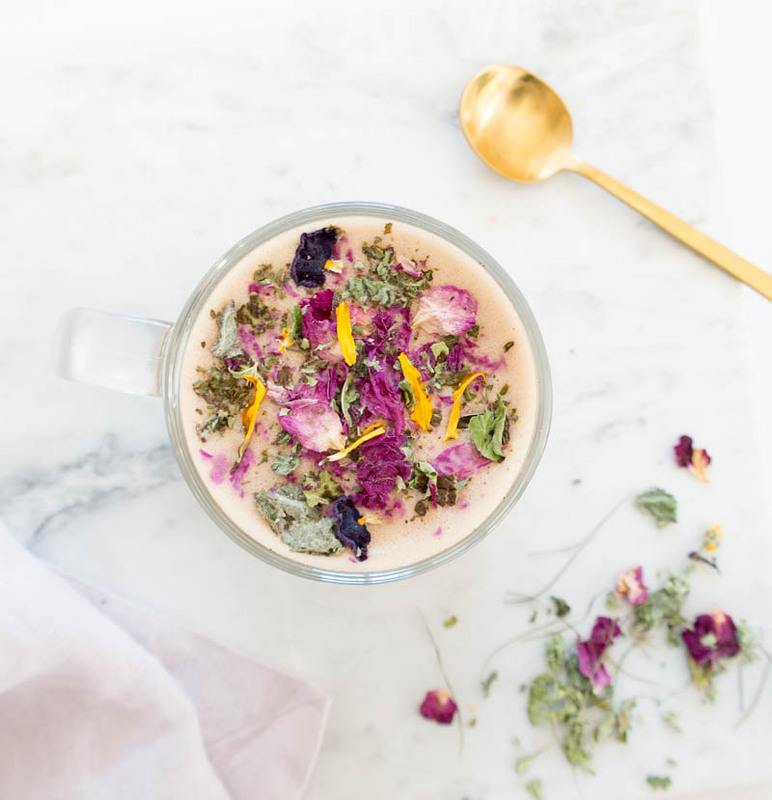 Adaptogens do not serve one single function; instead they’re able to adapt to whatever it is your body needs help with at that time, and work to balance or alleviate the symptoms. So cool, right?!! They’re an all natural way to holistically support your health. Feel free to do your own research on adaptogens – there are so many! But today, it’s all about the shrooms. So what’s in this healing elixir?! Let’s talk ingredients. 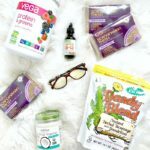 I’ve talked about Dandy Blend before, in this post but I’ve since perfected the recipe which is why I’m sharing it with you today. 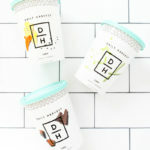 Dandy Blend is a herbal coffee substitute that has no acidity or bitterness, while offering a slight natural sweetness from roasted dandelion and chicory roots. Dandy Blend features the smooth texture and rich taste of real coffee, and dissolves instantly in hot or cold liquid. It contains no caffeine, no bitterness, no pesticides, no GMO’s, no gluten and nothing artificial. There are so many benefits of dandelion tea, ranging from liver detox to digestion help, and even to improve blood flow & circulation. The ingredients are: extracts of roasted barley, rye, chicory root, dandelion root and sugar beets. It really is the perfect herbal coffee alternative! The mushroom blend from Four Sigmatic contains different species of functional mushrooms that have all been widely researched. Chaga, Reishi, Cordyceps, Lions Mane, Shiitake, Maitake, Enokitake, Agaricus, Meshima and Tremella (and also Rose hips too). This makes it easy to consume different kinds of mushrooms, without having to buy each one separately. The benefits of medicinal mushrooms?! There are so many! 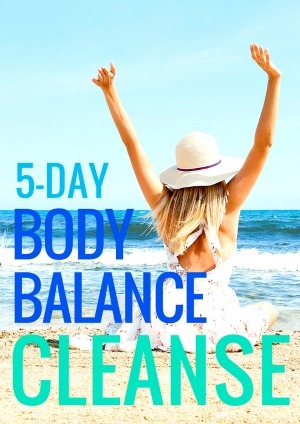 They all have game changing health properties that help with alertness, brain function, immunity, energy, balancing hormones, liver and kidney health, and longevity, to name a few. I love that I can add a major health boost to my lattés! You can add it to your regular cup of coffee too, as well as smoothies, soups, etc. To me, it doesn’t really taste like anything except the faintest flavor of earthy herbal tea. Coconut butter is my one true love. It tastes like fluffy, creamy coconut clouds sent straight from the heavens. Talk about dreamy. 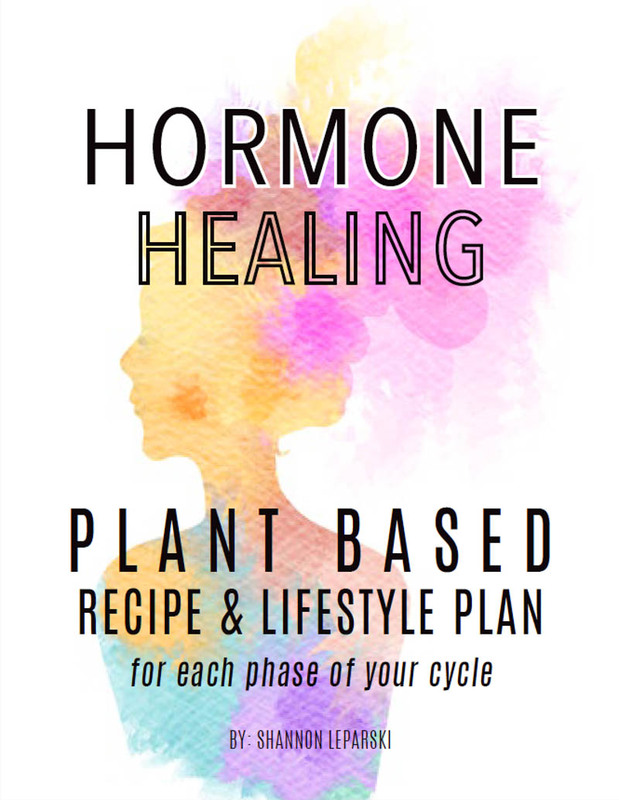 My love for it started after I began incorporating more fats into my plant based diet, after trying to balance my hormones naturally. FATS ARE CRUCIAL. 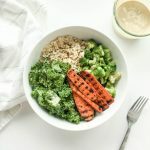 I literally eat spoonfuls of this coconut butter out of the jar because it tastes so darn good and because coconut butter has all the healthy brain-boosting fats to keep you satiated and balanced. Plus, adding it to your lattés will give it that frothy creaminess…. mmm! *** After heating up the coconut milk, I add all ingredients to my glass mug and use my lovely frother tool (only $10!) to blend/froth it up. This way is SO EASY because all I have to clean is the little frother tool but feel free to blend it in your blender or nutribullet if you feel like it. There’s no right or wrong way! Also, I topped my mug with the prettiest edible flowers, but thats totally optional! And how cute is that gold spoon though?! Coconut Adaptogenic Mushroom Latté. 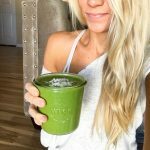 Vegan, Gluten Free and Caffeine Free latte! 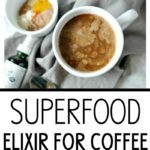 Made with an herbal coffee substitute called DandyBlend and a healing mushroom blend from Four Sigmatic for a coffee replacement! optional: top with edible flowers! 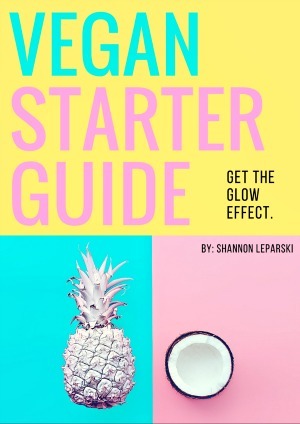 Start by heating up the coconut milk in the microwave or over the stove. Add all remaining ingredients to a coffee mug or to a blender, depending on if you have a frother tool or not. Then carefully pour the hot coconut milk over the ingredients in the coffee mug (or pour it in the blender). Use the frother tool to blend/froth or blend in blender until smooth and creamy. I topped mine with edible flowers which is totally optional, obviously. ooohhhhh my gosh, this not only sounds delicious but LOOKS delicious!! 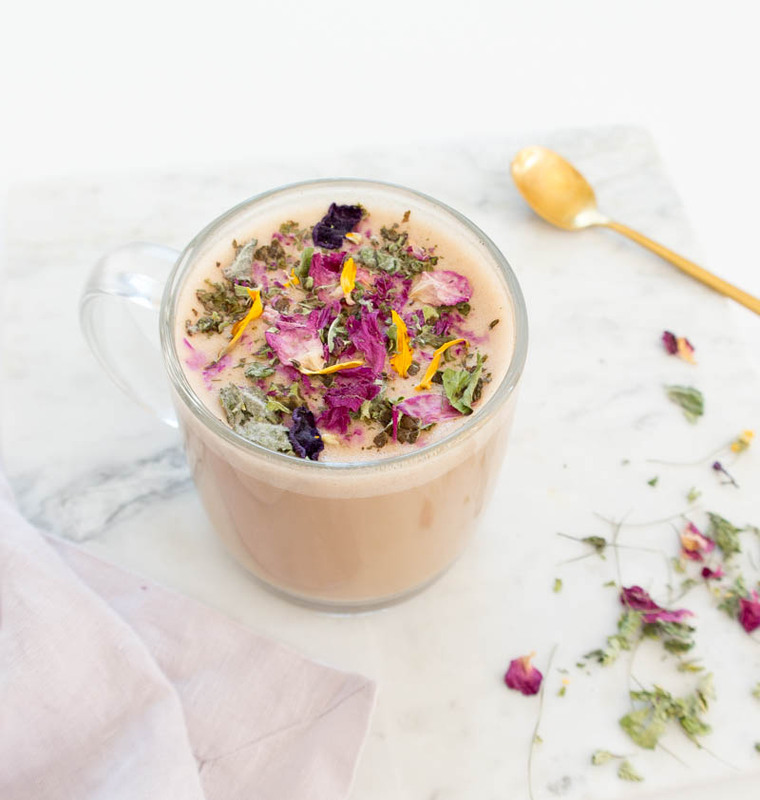 edible flowers, or flowers in general really, just make everything so beautiful 🙂 thank you for sharing this recipe – i’ve been trying to become less addicted to coffee but i definitely need some sort of energy-boosting drink in the morning. can’t wait to try this!